When you get into the vehicle, insert the RENAULT card integrated key, pointing towards you, fully into the card reader 2. To start, press button 1. If a gear is engaged, depress the clutch pedal to start the vehicle. 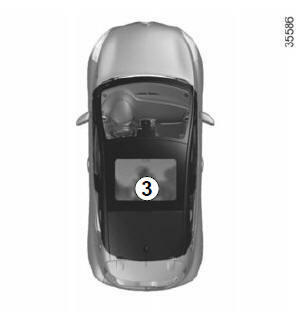 The RENAULT card must be inserted in card reader 2 or in detection zone 3. To start, depress the brake or clutch pedal and press button 1. If a gear is engaged, the vehicle may only be started by depressing the clutch pedal. In this case, the RENAULT card must not be located in the luggage compartment. 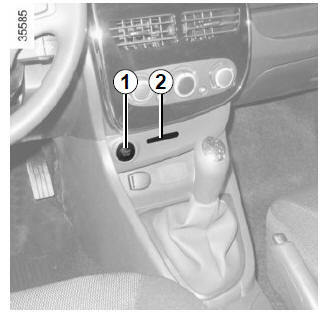 The lever should be in position P.
in some cases it will be necessary to move the steering wheel while pressing the start button 1 to help unlock the steering column; the message “TURN STEERINGWHEEL + START” warns you. in the event of starting the engine in very low exterior temperatures (lower than -10°C): hold down the clutch pedal until the engine starts. Once you have gained access to your vehicle, you may use some of its functions (radio, navigation, wipers, etc.). vehicles with a RENAULT “handsfree” card, with the card in the passenger compartment or inserted in the card reader 2, press button 1 without depressing the pedals. Note: depending on the vehicle, pressing button 1 starts the engine. Never leave your vehicle with the RENAULT card in the reader or in the passenger compartment while there is a child (or an animal) in the vehicle, even for a short while. They may pose a risk to themselves or to others by starting the engine. The message “PLEASE INSERT KEYCARD” appears on the instrument panel. Insert the RENAULT card fully into card reader 2. 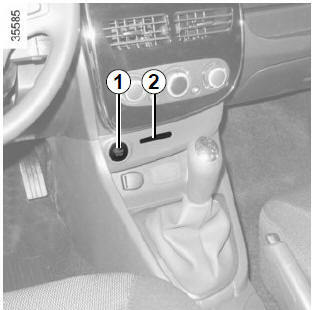 The vehicle must stationary, with the lever positioned in N or P for vehicles with an automatic transmission. Depending on the vehicle, accessories (e.g. radio) stop working either when the engine is switched off or when the driver’s door is opened or when the doors are locked. With the card in reader 2, press button 1: the engine will stop. Removing the card from the reader locks the steering column. If the card is no longer in the reader when you try to switch the engine off, the message “NO KEYCARD PRESS AND HOLD” will appear on the instrument panel: press the button 1 for longer than two seconds. With the card in the vehicle, press button 1: the engine will stop. The steering column is locked when the driver’s door is opened or the vehicle is locked. If the card is no longer in the passenger compartment when you try to switch the engine off, the message “NO KEYCARD PRESS AND HOLD” appears on the instrument panel: press the button 1 for longer than two seconds. When you leave your vehicle, especially if you have your RENAULT card with you, check that the engine is completely switched off. Never leave your vehicle with the RENAULT card inside and never leave a child (or a pet) unsupervised, even for a short while. There is a risk that they could start the engine or operate electrical equipment (electric windows etc.) and trap part of their body (neck, arms, hands, etc.). Never switch off the ignition before the vehicle has stopped completely. Once the engine has stopped, the brake servo, power-assisted steering, etc. and the passive safety devices such as air bags and pretensioners will no longer operate.